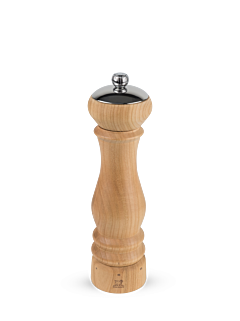 The Peugeot salt mill is a welcome addition to both the kitchen and the finest dining tables, with an innovative mechanism specifically adapted to dry or moist salt, to reveal all the richness of its aromas. 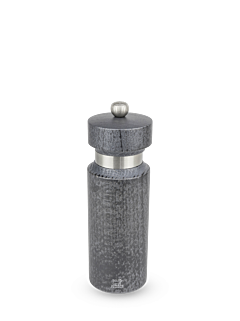 Manual salt mill in acrylic 11 cm - 4,5in. Salt is an activator of the perception of tastes and flavours, there could be no gastronomy without salt. That's why Peugeot has devised an exclusive collection in which every salt mill, with a mechanism guaranteed for life, meets the requirements of the salt inside. 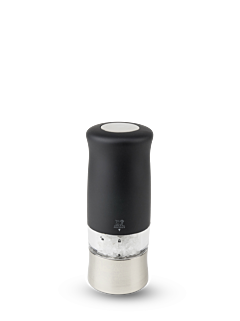 A stainless steel, corrosion-resistant mechanism is specifically adapted to dry salt crystals, grinding them into a fine powder that is sprinkled over dishes to bring the flavours to life. A specific, patented, innovative mechanism has been specially designed for wet or compacted salts, with three blades that ensure its performance and a helix that stirs the salt to separate it. 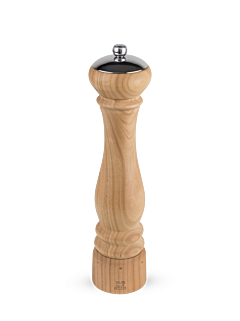 Guérande salt mills, electric or manual salt mills, wooden, stainless steel, brushed ABS or crystal salt mills... The Peugeot salt mill represents the ingenuity of artisanal savoir-faire and an aim to constantly improve everyday essentials. 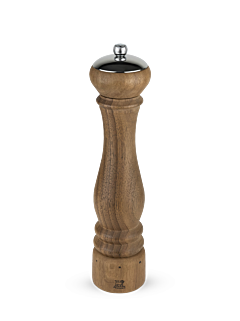 As well as being absolutely necessary in the kitchen to make every dish a great dish and reveal the flavour profile, the salt mill is also a stylish item that will adorn the finest tables.